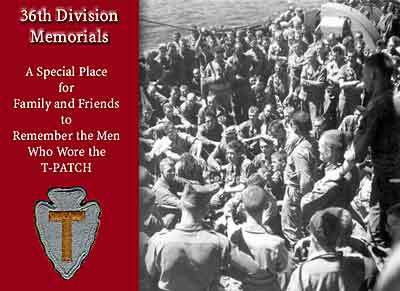 36th Division family members and friends are invited to contribute images and text with which we might create an appropriate memorial. This opportunity is available to all men who served with any unit attached to the 36th Division. Photograph, above, is aboard ship, September 8, 1943, the day before the landing at Salerno, Italy. The memorial directory is sponsored by the family of Edward S. Cahoon. Bernard L. Webster, Anti-Tank Co.